Approaching the marina from the A27 and take the B2123. Turn right at first set of traffic lights, look for the signposted Brighton Town Centre, Racecourse and Marina Village. Turn left at second set of traffic lights, pass the Racecourse and follow the signs for the Marina Village where there is free parking for 1500 cars in the multi-storey car park. Sussex is normally based at Eastbourne so we do not have a permanent berth to operate from Brighton Marina. 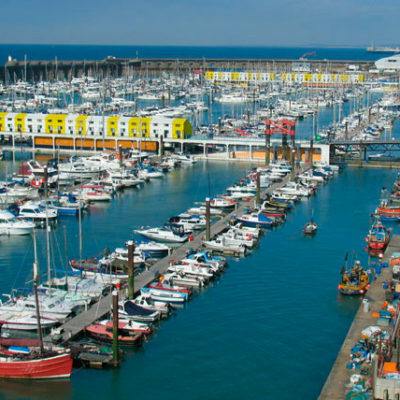 Brighton Marina will put Sussex on a berth overnight, but in the morning, the boat will be moved to a position near the Walk Ramp leading down to the pontoons. Access to the Walk Ramp is controlled by an electronic key so somebody will be at the top of the ramp to greet you. Trolleys are available inside the electronic key access gate. 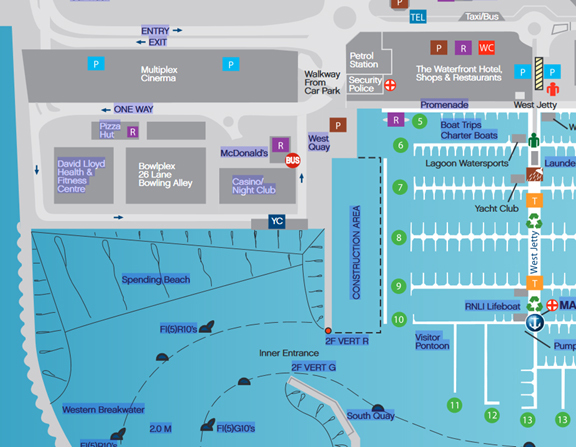 Before parking in the Multiplex Carpark, you will need to drop your gear off at the access gate and then move your gear to the boat, before parking your car.